You have voted - and the results are in (see Vote for the best artwork on an art blog in 2010) and today I can announce who has won Best Picture of 2010 on an Art Blog. Many thanks to the hundreds of art bloggers who took time out over the festive season to come and view the nominations and vote in this Making A Mark Awards Poll. The winner of the Best Picture of the Year (Portrait/Figures) is "Hands of Time" an oil painting by Karin Jurick (A Painting Today). Nominated by me - Katherine Tyrrell! Karin Jurick got over 43% of the vote and has repeated her win in this same category in 2009. We have a dead heat for this category despite the hundreds of votes cast! Third place was taken by Terry Miura (Studio Notes). The winner of the Best Picture of the Year (Still Life) is Black Grapes #3 by James Neil Hollingsworth (Paintings in Oil). Nominated by Belinda del Pesco. Neil attracted 35% of the vote and this was a category which was keenly contested with the lead changing many times during the course of the vote. 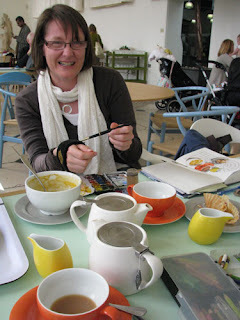 Jeanette Jobson (Illustrated Life) was second and Tracy Hall (Watercolour Artist) was third. 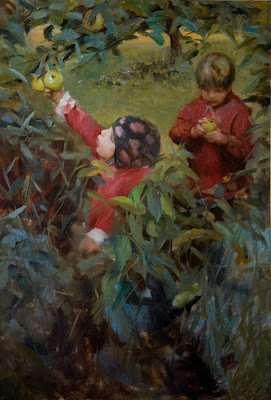 Karin Jurick for "Hands of Time"
However I’ve got a new idea for next year which I’m hoping will include Karin's astute eye for what makes a good painting - of which more in the New Year. 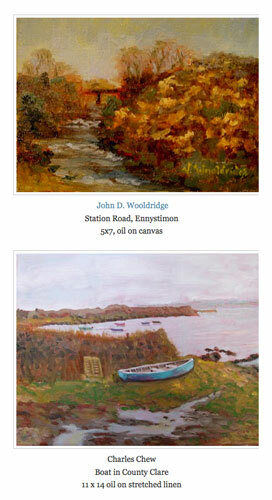 Note: Every year, the voting always tends to indicate pretty early on which painting is likely to win this award. This year I identified a problem with some significant fluctuations in the voting which was investigated and, after much analysis, was addressed through the elimination of one of the entries. I'll be reflecting on the lessons learned in the New Year and seeking your help in thinking through how best to conduct this competition next year. Posted by Making A Mark on Friday, December 31, 2010 10 comments Who's linking to this post? Categories art, art blogs, feline art, figurative art, landscape, making a mark, Making A Mark Awards, painting, pastels, portrait, still life, who's made a mark this year? I recived one nomination for this award. According to Kimberly Santini Lisa Daria for the Moose Award and the Stickability one - Lisa Daria (Lisa Daria) was is a daily painter who tackles a variety of subjects, always accompanied by her studio assistant, Brie, a big fluff ball who gets into all sorts of troubles. Tripod seems to rule the roost and the turkeys at the Jobson home in Newfoundland despite only having three legs. 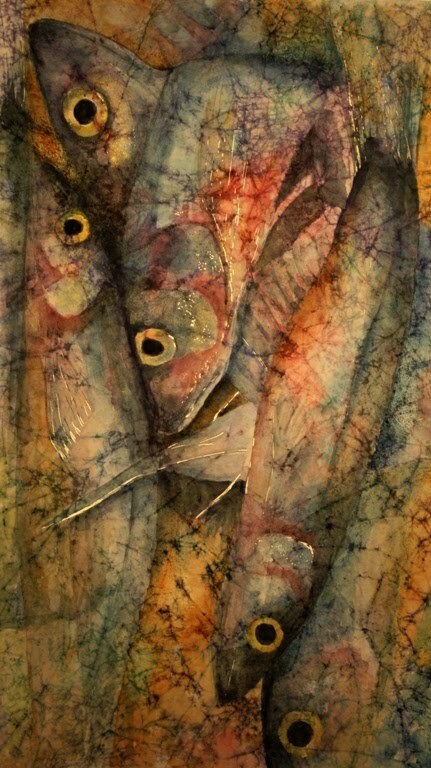 Now of course he also has the added distraction of an artist in the family who's rather interested in fish! He's also featured in very many drawings and paintings over the years and has always come across as an animal with a strong male character. He's become a bit fussy with age (don't they all?) and only occasionally now consents to model - for a fee! 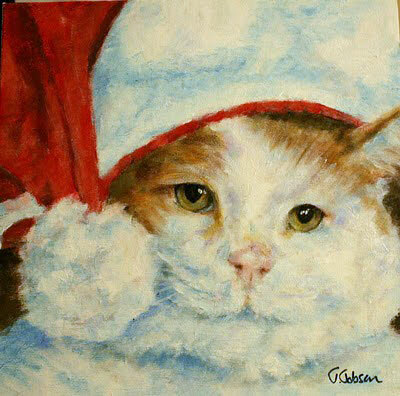 His owner made an unknowing bid to capture my attention with a rather fetching Christmas painting (see right) and I succumbed! Originally two awards but combined into one for the last two years. "The Amusing Musings Trophy" is for keeping me amused. The “Tales from the Frontline - Mention in Despatches" - my favourite blog by somebody who lives with an artist. For the Most Improved Studio of the Year - to reflect the continuous efforts of artists to improve our studio environments. 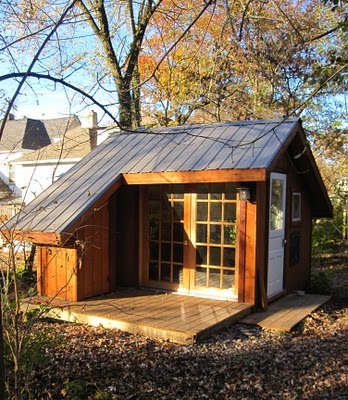 The brilliant thing about this project was that Cathy set up a blog to track the whole process of creating a new studio in a shed. It not only provides a record of the various trials, tribulations and achievements, it's also a marvellous source of information with lots of links for anybody else trying to tackle a similar project. I'm sure Cathy would also want to make sure that I mention Joseph's part in bringing this project to fruition. 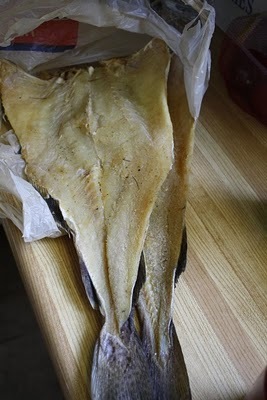 Posted by Making A Mark on Friday, December 31, 2010 3 comments Who's linking to this post? Categories animal art, art, art blogs, art studio, making a mark, Making A Mark Awards, who's made a mark this year? My nomination for the Best Art Blog Project Virtual Challenge Cup is The Virtual Paintout by Bill Guffey. Using Google Streetview as a source of inspiration for paintings provides just the right degree of unity around a shared theme, and diversity of subject – and lends itself to an incredible variety of interpretations. It’s hard to say which is more fun, finding your perfect location by navigating around the selected area on Google, or looking at all the great stuff other people have found! To explain, the challenge runs all year long with a Monday check-in. Then, in November, check in is daily. Optional themes are given each month for exploring, or not. What I think is special about this art blog is the vast array of artists who participate: fine art, fine craft, writers, dancers, photographers, etc. Leah started the challenge in 2008. I also like the wide range of experience in the participants. The Creative Every Day Challenge is an older and bigger site and obviously attracts a lot of participants. It's also very laudable to be promoting creativity amongst art bloggers. However in terms of accessibility I found it a bit difficult to navigate and I did notice you didn;t need to be an art blogger to participate - and these awards are about art blogging. By way of contrast, the joy of Bill Guffey's Virtual Paintout site is that it has a very simple concept which is the same every month - painting scenes from specific locations using Google Streetview. The only thing which ever changes is the place and the map. The participants get to choose the location they want to paint and then provide the link to the map and the image of what they've produced to Bill for posting to the blog. Bill has succeeded in attracting a large number of participants every month - and the benefit is that you can see all the pictures on the blog and that makes it very easy for non-participants to understand the project and see its results. 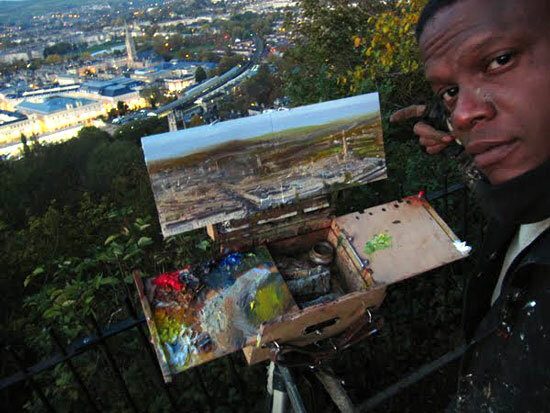 I also like the way that it shows people that they can find places to go and paint plein air using Google Street View and consequently its impact is not just limited to this blog! This isn't just a prize for people who can produce good paintings. This award applauds "stickability" which is a quality which not all blogging painters necessarily possess. 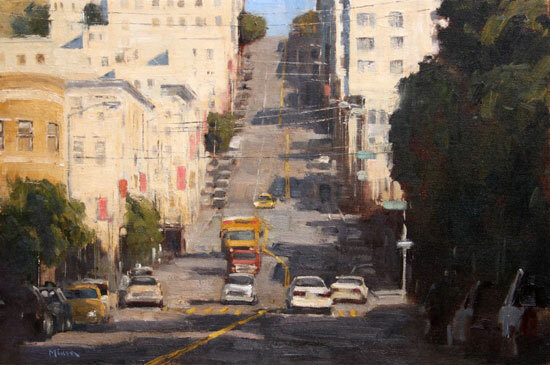 The first two artists to win it, Duane Keiser and Julian Merrow Smith both posted a new work every day for well over a year - all of which sold extremely well. Those that have followed have also produced a very large total of paintings every year. That's the sort of standard I'm looking for in terms of a daily painter who can follow in their footsteps. Some of the artists nominated simply did not qualify on the basis that they simply are not producing enough work. Hnece they have not been included in the list of nominees below. I've allowed the nominatins to stand where artists are producing on average in excess of 15 paintings a month although obviously I'm looking for more than this. Nominations for this award include the following. Lisa Daria (Lisa Daria) Nominated by Kimberly Santini who said I'd like to nominate Lisa Daria for the Moose Award and the Stickability one - she is a daily painter who tackles a variety of subjects, always accompanied by her studio assistant, Brie, a big fluff ball who gets into all sorts of troubles. Kimberly Santini (Painting A Dog a Day) I'd like to nominate myself for the stickability award - and there's some great company here! 2010 saw the creation of daily painting #1000, a wine issued with one of my daily paintings as it's label, an invitational solo exhibition comprised of my dailies, and my induction to the esteemed Daily Painters Group, among other accomplishments. Nithya Swaminathan (A Splash of Color) nominated by herself. I have created over 300 pieces this year. I took up a project titled "300 to 30" where I planned to complete 300 pieces before my 30th birthday, which was earlier this year. Not only did I go on to complete about 305, but stayed with the momentum to paint much much more than I did in all previous years put together. I have not literally produced a new painting everyday though, because I was on vacation for a month, and there have been other times too when I missed painting. Like I said - one if the key criteria I'm looking for is "stickability" - and on that basis there's just one artist that really qualifies to walk off with this award. I'm very grateful to Kimberley Santini for drawing my attention to Lisa Daria. I've had a lovely time looking through her blog at her wonderful paintings this afternoon and was very nearly distracted and started to buy a painting! Always a good sign of a very promising painter! Her blog has gone straight into my list of blogs that I follow. Significantly, Lisa Daria is the only nominee to have produced a painting every day this year. After one year of painting every day (including Christmas) I've no intention of stopping. For me, daily painting is a daily appreciation for living via the canvas. I'm a young adult cancer survivor so I have a persistence to make sure every day matters. 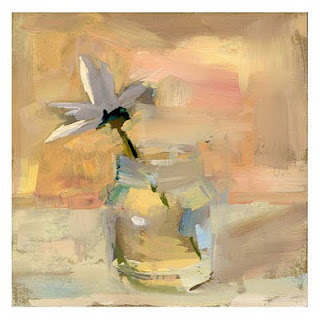 Daily painting has become a reminder every day can bring with it reason. My optimism and perception have become part of the process of creating each day without reservation or excuse. The finished painting represents a consistently positive and stabilizing presence of my view of my immediate surroundings. No more words are necessary - this is a lady whose 'stickability' we can all admire. Posted by Making A Mark on Thursday, December 30, 2010 5 comments Who's linking to this post? Categories art, art blogs, art of the landscape, daily painting, making a mark, Making A Mark Awards, painting, painting a day, who's made a mark this year? This award value blogs which also aim to share good information - including what they have learned - with others. This is a particular favourite of mine as it's what an awful lot of this blog is about. It's not limited to artists who are also teachers, it's also open to those who just love to share what they've found out (like me!). Stapleton Kearns (Stapleton Kearns) Nominated by S. M. Lacy Stapleton Kearns writes a blog for painters, and has posted almost every single day for 2 years. Every post is useful (similar to James Gurney's site). It's a huge resource. I have learned so much from reading. Deborah Secor Landscape Painting in Pastels and Deborah Secor: Today's Art Class. Deborah is an experienced artist/tutor who shares an exceptional amount of her knowledge and experience online - including the content of her classes. 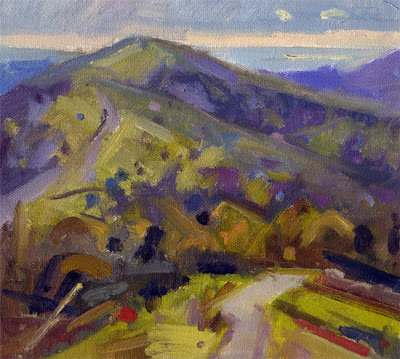 Richard McKinley (The Pastel Pointers Blog) is an experienced artist/tutor who contributes regular and thoughtful posts about the practice of painting landscapes with pastels. These have now been published by North Light Books who also commission Richard to write his blog. Paul's blog is a one-off. It's a record of a journey in relation to classical techniques which occurs in fits and starts. However Paul produces long and interesting posts when he's posting and has a significant fan base. He also draws and paints rather well. Artist/tutor blogs, such as the ones written by Kearns, Secor, McKinley and Cabrera, are typically distinguished by the fact that they are often well written, often very practical, often very useful and produce regular content. This content then varies according to the individual interests and preferences of the artist/tutor. In some ways it seems invidious to try and choose between them as I know I read and enjoy them all and they all have their own particular pros and cons. I'm trying to avoid doing split prizes this year. I've also looked back at the previous winners of this prize and it strikes me I do like people who provide a good read! Consequently I'm going to award the prize to the artist who most often tackles the spread of topics which most appeal to me. He achieves a nice balance between art technique, art history and art business (although I think he needs to rationalise his two art business labels into one!). If there's one thing I would change it's the black background which I find makes his posts more difficult to read. To be eligible for this award you must make me think and offer insights which are transferable to the activity and business of being an artist. This is the award which leans more towards matters pertaining to being an artist rather than artistic practice per se. 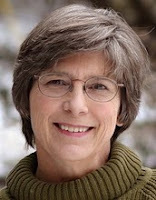 So less "how to paint" and more "how to avoid being a starving artist"
Elizabeth Barton (Art and Quilts, cogitations thereon ) Nominated by cynsartquilts.com She writes about her experiences making, observing, teaching, reading, and critiquing. She is also very interactive with the people who comment, encouraging a real online dialog. Katherine A. Cartwright (Katharine A. Cartwright Studio) Nominated by Casey Klahn. Seconded by Peggy Stermer-Cox Kathy posts book reviews and hosts a discussion style format via her comments. A community has developed there, and I always look forward to the thoughtful interaction that takes place. For Learning about the art business the Rise Art Team would like to nominate blooger Kirsty M Hall for her work on encouraging and supporting artists in finding their way online. To these I'm adding Joanne Mattera - Joanne Mattera series on Marketing Mondays. This is extremely wide-ranging in its coverage of very practical issues for artists. The content is also very helpful and I invariably find myself highlighting them on Who's made a mark this week? It's good to see artists being nominated by more than one blogger so congrats to Katharine A Cartwright and Kirsty Hall for that distinction. I've always thought Kirsty wrote in a fresh and accessible way and lights on topics which might pass me by - which means she often makes me think. Katharine is an artist and an art instrucor and her blog is less well known to me although I have visited before. It looks like it's a good place to go when you want to give your brain cells a bit of exercise. She also has the merit of writing blog posts on a regular basis. Elizabeth's blog has got lots of good stuff to read but I find the stretched format and the big blocks of text a bit of a challenge to read - but I've got this 27" screen for a reason not unconnected with cataracts! I'm finding narrower columns and short paras work really well for me. I'm afraid Corinna's blog is one I don't know so well - so congrats on the nomination. Joanne tackles the really routine issues relating to doing business and marketing your art which affect most artists. Plus she also covers some aspects which are less routine but useful to know about none the less. I find that she almost always manages to bring a fresh perspective on what might be thought of as the "same old topics"and she often manages to add some small nugget of information which I've not heard before. She certainly makes me think. Many a time she's popped a thought into my head while I've been reading one of her Marketing Mondays posts which has then turned into a blog post on Making A Mark. She's also consistent and reliable. So much so that she is now one of my regular ports of call whenever I'm constructing my weekly blog posts - and by definition that puts such a blogger in the running for an end of year Making A Mark award! There were some great new art books published this year - but this NEW award is limited to those written by artists with active art blogs which they write themselves! The author MUST be somebody who blogs about art - but they don't have to be an artist. The book should be published in 2010 but this is not an absolute and some flexibility is permitted in relation to books published at the year end. I'm aware of four artists who have written significant books published this year. This is one of the most difficult decisions I've had to make this year. I could make a very good argument for any of the contenders to win the award. I've enjoyed all their contributions on their blog and have read two of the books in print, all of the third onscreen and most of the fourth onscreen. 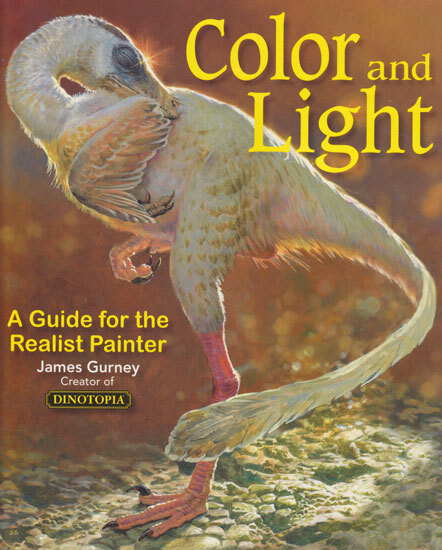 James Gurney's book Color and Light: A Guide for the Realist Painter managed to go straight to the top of the charts on pre-publication sales. I can only imagine that those who bought the last book and/or read James blog Gurney Journey were very happy to order the new book. Of course a lot of the material had already been published via his blog as he wrote the book. However there's nothing quite like having it in book format so you can read it through and/or dip into it for reference purposes. I've had a rule up until now that you can only win a prize once. To be honest if I didn't have that rule, then James would probably edge it as he has written a really excellent book (see my review Book Review: Color and Light by James Gurney). This is because he's written a book which focuses on a very important topic about which very few good practical books have been written. It has the distinction of being a valuable addition to my existing library of all the good books on the topic written so far! Richard McKinley (The Pastel Pointers Blog) for Pastel Pointers: Top 100 Secrets for Beautiful Paintings. Richard is another artist who has written his book on his blog - and with the support of North Light Books, has then gone onto publish it. It's now doing very well in terms of sales. I haven't seen the book yet but I do read all his posts on his blog and they are excellent practical advice from an experienced artist and good tutor. Deborah Paris (Deborah Paris) for Studio and Business Practices. Interestingly this was not written on her blog. However Deborah does share all the lessons she's learned as a professional contemporary artist. I think it's an excellent book and found myself nodding several times as I read it. It has a small format and only 76 pages but while very slim the emphasis is on being succinct and making every word count. It's packed full of advice about sound studio and business practices for artists. 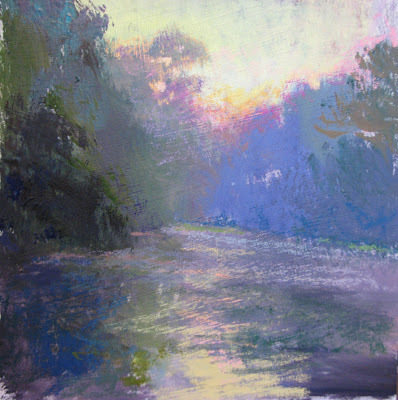 Deborah Secor (Landscape Painting in Pastel) for Landscape Painting in Pastel - which has been published in full on her blog of the same name. The difference here is that the book is not going to be published in print. Deborah's book is very thorough and I'm guessing might possibly be a tad too long for most publishers these days. She's also thought of more subject matter she'd like to cover so there's more to come! I've pondered this one backwards and forwards. I've read all the material on Richard and Deborah Secor's blogs and it's all very helpful. I think Deborah Paris's book is simple but extremely useful and has the advantage of being written by an artist who has run a business and hence knows which way is up and how to manage the income stream. In the end the one factor which differentiates these is that Deborah Secor has sought no financial reward for her book. She has published it for the love of giving. That's one of the best things about art blogging - we're sharing freely with one another. I contemplated selling this book, but in the final analysis I decided that it was better to give. Jesus tells us, "Freely you have received, freely give." So I will. I hope you enjoy and benefit from it. That makes this a book for me which stands out - and it seems to me a prize in recognition of the quality of her book and that giving freely would be most appropriate. Thank you Deborah! Posted by Making A Mark on Wednesday, December 29, 2010 0 comments Who's linking to this post? Posted by Making A Mark on Wednesday, December 29, 2010 5 comments Who's linking to this post? Readers of this blog were invited to nominate work (which can be seen in yesterday's posts - listed at the end). I've then selected a shortlist for each of the three categories. There is, of course, no right or wrong answer to which pieces should be selected from those which were nominated. Before the display of images of the shortlist I've said a few words about why I chose the works that I did. You might also be interested in my comments in a couple of posts I did last year which provide some more context for making a selection - here are my thoughts on Selection, jurying and must-see lists and Juried art competitions - does size matter? You now have four days to vote for which is the best artwork in each category. There are FOUR polls below - please take your time and vote on each. 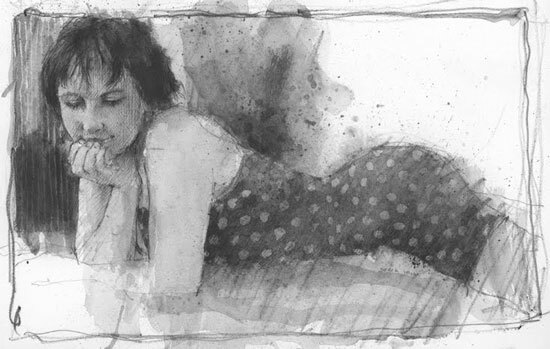 The Making A Mark Awards likes to highlight drawings as well as paintings and Derek Jones' drawing made using a graphite watercolour pencil and a brush is one of the reasons why. 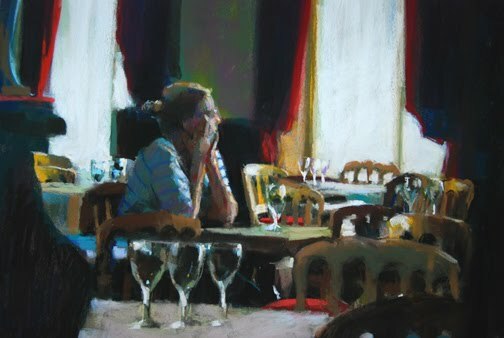 I've always liked figurative paintings of people in interiors and sketch them a lot myself so Margaret Dyer's painting of Dejeuner immediately appealed to me. Belinda nails the reasons why it's also a good painting. 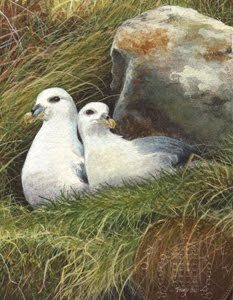 Unfortunately the delightful painting which was original nomination for a work by Anntii Rautiola proved to be a 209 painting posted to his blog in 2009 and was hence ineligible. However I did like this artist's paintings of his children so I selected another one of the two children. 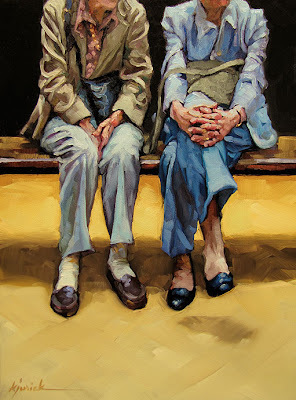 The 100 faces project of last year's MAM Award winner Karin Jurick's was nominated for this prize but I feel this is a great project whereits chief merit lies in the totality rather than one individual painting. However while looking through through Karin's blog I came across Hands of Time which for me is a really great composition and portrait. As many will know by now, the reasons why paintings get selected for a shortlist can be as much to do with the juror as the artist. I know the view of the Malverns painted by Antony Bridge and I've seen many paintings of it and it's always good to see another one. Like Michelle Basic Hendry, it's my view that Interiors are also landscapes - and ones which are undervalued as a subject to paint. Her painting is impressive. I've admired Terry Miura's work for a long time. His one was one of the first blogs I started following. I'm more used to seeing him paint country roads rather than urban landscapes however this one is a stunner. It also points up the townscape as a topic for landscape painting. I've added in a painting by Loriann Signori because I've liked her watercolour and pastel paintings for a very long time. 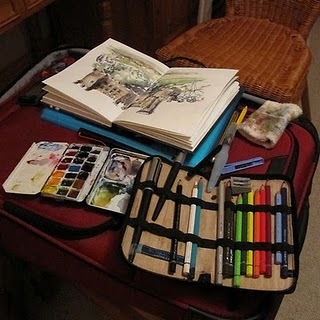 She's also one of the very few art bloggers who posts on a daily basis and has a prodigious output. 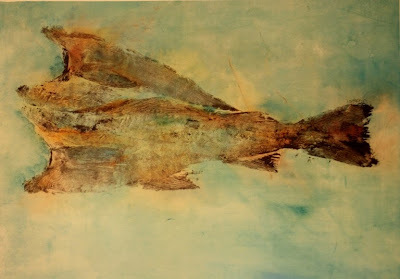 This is one of my favourite paintings by Loriann in 2010 and it was featured on this blog earlier this year. 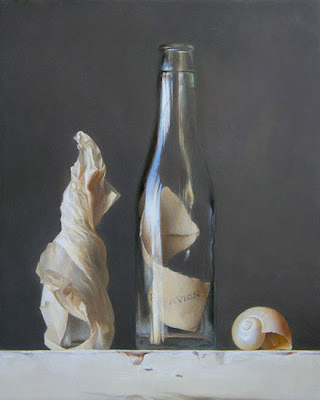 Still life over the years has seemed to attract artists interested in developing a high degree of realism while at the same time sometimes telling a story with their artwork. I've admired very many of the paintings Sadie J Valeri has produced this year and was pleased to see one nominated for this award. 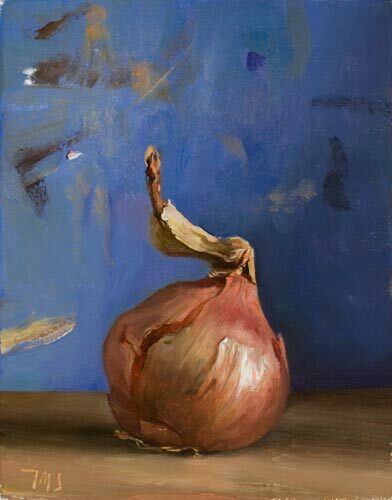 I'm just one of the very many fans of Julian Merrow Smith's work so it was pleasing to see one of his small still lifes nominated. 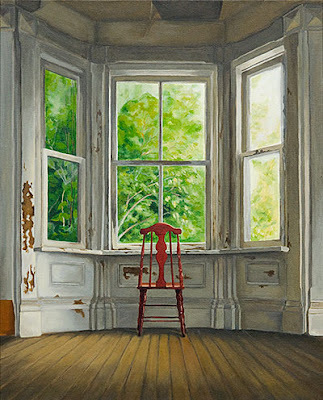 James Neil Hollingsworth was shortlisted last year and thoroughly merits his inclusion again this year. 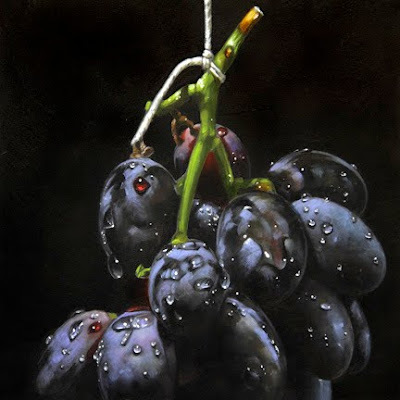 He produces a consistently high standard of still life paintings which while highly realistic are still emphatically paintings rather than trying to ape photographs. 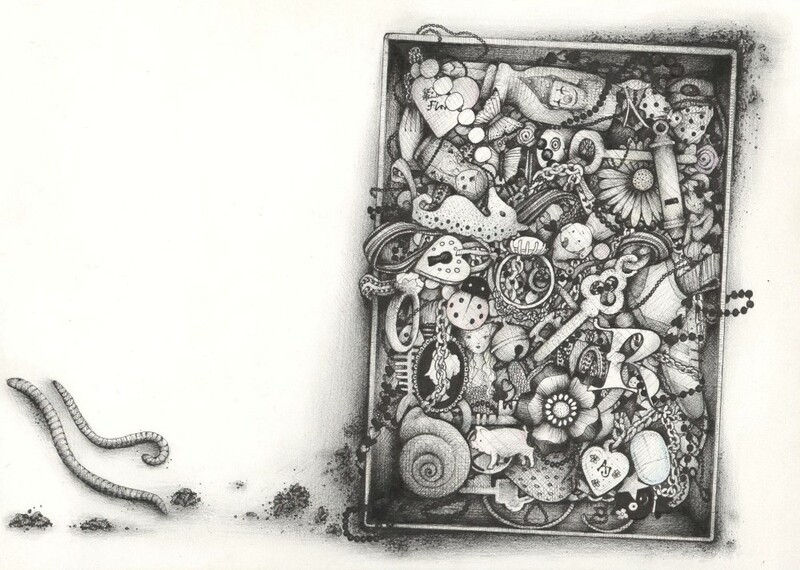 I've added in a drawing by Andrea Joseph who has a unique style of drawing with a ballpoint pen (that's as in no scope for mistakes!). 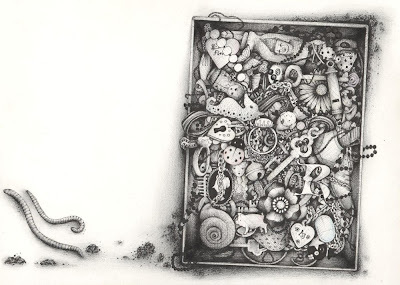 I love looking out for what is her latest drawing of a collection of objects. I spent a long time narrowing this down to just one drawing! and celebrates excellence in portraying every aspect of nature. This is a NEW prize this year. All three artists are renowned for creating art about animals. 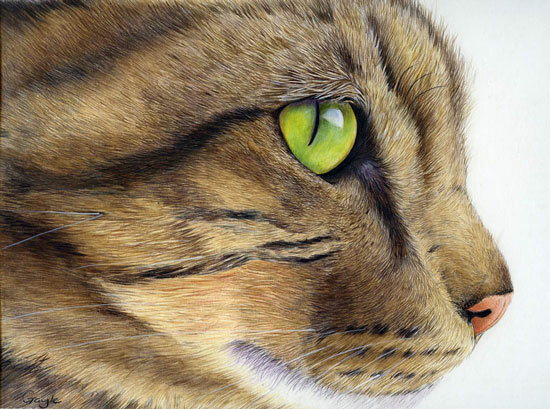 Gayle Mason has been producing her very popular macro drawings of cats for some years and this is one of her best. Jeanette Jobson has fascinated me all year with her development of a series of paintings and fine art prints about fish. She demonstrates on a regular basis how much creativity can be unleashed when the subject matter stays a constant. Tracy Hall continues to win awards for her miniature paintings and having handled a Tracy Hall miniature I can tell you that photography simply does not do justice to these works. With my best wishes to you and yours in this festive season. Posted by Making A Mark on Sunday, December 26, 2010 11 comments Who's linking to this post? Categories drawing, drawing people, landscape, making a mark, Making A Mark Awards, nature drawing, painting, portrait, still life, who's made a mark this year?